"Though an old man," Thomas Jefferson wrote at Monticello, "I am but a young gardener." Every gardener is. In Gardening in Eden, we enter Arthur Vanderbilt's small enchanted world of the garden, where the old wooden trestle tables of a roadside nursery are covered in crazy quilts of spring color, where a catbird comes to eat raisins from one's hand, and a chipmunk demands a daily ration of salted cocktail nuts. We feel the oppressiveness of endless winter days, the magic of an old-fashioned snow day, the heady, healing qualities of wandering through a greenhouse on a frozen February afternoon, the restlessness of a gardener waiting for spring. 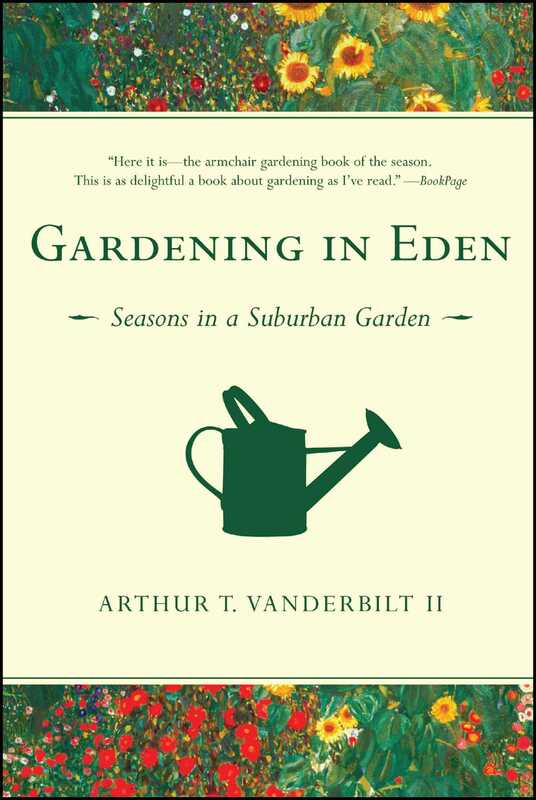 With a sense of wonder and humor on each page, Arthur Vanderbilt takes us along with him to discover that for those who wait, watch, and labor in the garden, it's all happening right outside our windows. Days of leaden skies, of sleet and snow flurries, day after day, depressing days of winter. Layers of heavy woolen clouds blanket days without sunlight, murky gray days from morning until late afternoon when the gray gets darker. "As the days grow longer," my grandmother used to say, "the cold grows stronger." And so it does. Cold gray January days, on and on without end, bleak days, one after another, when juncos seek shelter deep in the old rhododendron outside my kitchen window, huddling among its leaves curled tight as a child's cold fingers inside a mitten, and squirrels stay snuggled in their tree-trunk nests, their tails wrapped around them like winter scarves. My house is perched on the side of what geologists call the Second Watchung Mountain, though with its five-hundred-foot elevation, it's more a ridge than a mountain. From the front door, you can look far off to the east and, on a winter day, see the skyline of New York City and pick out the tallest buildings, then look southeast across the valley all the way to the ridge of the First Watchung Mountain and, to the left and right, along the horizon, follow the curve of the earth. Most of the year, though, you see trees, the tangle across the road at an edge of the two-thousand-acre Watchung Reservation, which stretches out between the ridges, and the canopy of treetops over the neighborhood below. From the woods across the road, a deer emerges on this bleak January afternoon etched in shades of gray; like a ghost it materializes from the tangle of trees and wanders up my driveway. Something is wrong. It can't put any weight on its front left leg without it buckling all the way to the ground. The deer hobbles up into the bushes, looking, looking, taking a painful step, then another, always looking. Was it injured by a car, a fall, a mistimed jump? It seems to be seeking shelter in the lee of my house, shelter from the dangers of the woods, from the coming snow. Despite years of deer wars, I feel no hatred toward this enemy straggler, who, without the use of a leg, has lost the very essence of what he is, of what makes him a deer, who has come here, to my yard, seeking refuge. Could I set out some apples? Would he know I was trying to help or would that frighten him? What if he took up camp in my yard, what would I do? If he died here? I think of him as the snow arrives with the dark, another freezing wintry night to get through, to survive, wet, cold, starving, frightened, alone, a night when the cold is an enemy trying to break into the house, and the next morning I'm out early looking for him, searching for his tracks, but the dusting of snow holds no clues of his fate. It doesn't seem to snow anymore the way it once did. Of course, when I was growing up, weather forecasting had none of the computer-model sophistication it has today; a hurricane would slam into a coastal town that wasn't ready for it, and snow would arrive without warning. As a result, children back then seemed to have much more of an influence over the direction and intensity of a storm, so that a school filled with students intent on a snow day could, just as a lightning rod attracts lightning, actually draw a blizzard into town. Maybe we had some sixth sense about storms. Maybe, like animals, we could feel a change in atmospheric pressure and sense when a storm was approaching. However we did it, we always seemed to know with uncanny prescience when a big one was on the way. We knew just what sort of day was a blizzard breeder, the necessary weight and texture of the clouds, the exact sickly gray-yellow hue of the sky, the specific temperature that would be best, the precise feel of the air, and when these conditions converged, our teacher would be hard-pressed to keep our attention as we'd sneak glances out the oak-framed windows to make sure the conditions held, passing folded notes to establish the telephone chain if someone learned that school was closing. To get the kind of accumulation we needed, the snow would have to start in earnest by suppertime, and it had to be the right kind of snow. Several times between supper and bed -- repeatedly, actually -- my sister and I would turn off all the lights in a room and pull back the curtain to check how it was doing. None of that Robert Frost "easy wind and downy flake" stuff for us; nor were big wet flakes acceptable, or snow that fell tentatively, like it was finishing up for the night. Such snow would be shamed by our hisses and boos. We were looking for a snow with a seriousness of purpose, a heavy, hard, steady snow that wasn't going anyplace anytime soon, and we'd fall into sweet sleep with its steady swish against the storm windows. Instantly, on waking, we'd know even before we looked. There wouldn't be a sound. Not a car passing by. Not the push and scrape of a snow shovel. Not the grinding rumble of the city's snowplows. Total, absolute, pristine, wonderful silence, which could mean only that the snow was so deep it had shut down the city. Snow Day! Snow stuck to the storm window, covering it. This was a good sign; there must be just enough moisture in it for perfect snowmen, for snowballs and forts. A dash to a window in the front of the house: outside, a silent snowbound Currier &amp; Ives winter morning. We were expert surveyors then, and by bouncing from window to window, we took all the necessary sitings and triangulations to gauge its depth -- eighteen inches, a good two feet at least, two and a half, three feet, as high as the top step out the front door, higher than the wall around the terrace at the back of the house, deep enough to turn the bushes by the porch into mounds, and down the side of the driveway, wind-swirled drifts that could cover a car. Oh, yes, this was a snow day, no questions asked, no debate about it, no worrying that there would be a delayed opening. This was a snow day, and maybe even with a little luck, a two-day cleanup. As Mole in The Wind in the Willows knew, "the best part of a holiday is perhaps not so much to be resting yourself, as to see all the other fellows busy working." A snow day was even better than that; it was an unexpected holiday for everyone, a gift of a pure day. Whatever had been planned had to be canceled, no explanations or apologies required. What errands and chores should have been done couldn't be. We were isolated by the storm, enveloped together in the house, with a fire in the fireplace and a long do-nothing day stretching endlessly ahead: a snow day was more wonderful than a Saturday or Sunday or any holiday. After breakfast, shoveling out was the first order of business. By the time our mother made sure we were properly outfitted in bulky layers of heavy woolen clothes, shirts and sweaters and stiff winter coats, snow pants with straps that went under the foot, those black galoshes that buckled up the front, cumbersome mittens and itchy ski caps covered over with a hood tied too tight under the chin, attire that would have been excessive for explorers on a three-month expedition across the ice floes of the Arctic, we would have agreed to do anything to get outside. The idea of shoveling seemed an adventure, humanity against the elements, and off we waddled down the stairs to the garage to get the shovels. Opening the garage door was like raising the curtain on a spectacular stage setting: the storm had taken away our familiar world and replaced it with the Yukon. Either we were a lot shorter then or those snows truly were monumental, for it was all we could do to hopscotch through the virgin depths up the drive to where the sidewalk should be and, shovelful by shovelful, begin to clear a single-width path through the snow into the house. There were always gangs of older boys (dressed in flannel shirts and jeans, with a ski band around their ears and boots flapping open) who'd come house-to-house to shovel driveways for a few dollars and neaten up our wavering paths where we thought the sidewalk, more or less, should be, so there was plenty of time to get on to the real business of building the forts from which bombardments would be launched and repulsed. If the conditions were just right, you could cut out building blocks from the snow in the backyard and stack them up and smooth them together, igloo-fashion, to construct a pretty formidable fort that would be stocked with rounds of snowballs. Later, when a truce was called, the old wooden toboggan our parents had when they were growing up was hauled out of the furnace room for rides down the hill along the side of the house, all the way to the back of the yard, and once that path was established, the runway was perfect for the sleds and plastic flyers. By dusk, when our neighbors started drifting home and we had filled the bird feeders with sunflower seed and suet, the buckles of our galoshes were embedded with snow and ice, ice pellets stuck to our mittens and filled our shoes and socks, and every layer of clothing was pretty well soaked with sweat and snow and smelled like wet wool. We sat by the fireplace with mugs of hot chocolate laced with marshmallows as the oak-log embers sputtered and flared colors when our father tossed in a handful of the special salt powder, and we read in the flicker of the flames whether school would be closed again tomorrow. This was real snow, not today's slushy mess that's gone before the week is up. January snow froze solid and stayed around, day after day getting older, more scarred, pitted, stained, finally overstaying its welcome until it became as tiresome and oppressive, as maddening, as the snows of Willa Cather and O. E. Rölvaag. Physicians don't talk about it, but it's a fairly simple matter to self-diagnose when you're coming down with snow madness; the symptoms are obvious and easy to spot. Complexions assume the waxy tallow sheen of candles. You feel too hot inside the house and too cold outside. Family members begin casting black looks at you as if, when arguing about the most inconsequential trivialities -- which are all that is talked about now -- they are contemplating setting your mattress ablaze as you sleep. You begin to feel an uncomfortable physical pressure in being housebound, and when you step outside to escape the pressure, you feel hemmed in by the frozen drifts that loom above the narrow walkways. Every single time you pass the Burton house, you stare at the discolored spot in the snow where a dog relieved itself weeks ago, and by the corner of the Picketts' driveway, you kick that annoying jagged edge of ice again to try to break it off and again hurt your toes and again stomp at it with your heel, and still the accursed chunk won't break off, and the sound of the snow crunching under your feet becomes as grating as Mr. Stoltz dragging his fingernails across the blackboard, and you track in grit and salt. Life has become mere existence. Bundled up, winter-weary, you plod along day after day. "Spring is too far away to comfort even by anticipation," Joseph Wood Krutch wrote of these depressing days, "and winter long ago lost the charm of novelty. This is the very three A.M. of the calendar." When such symptoms persisted for more than a week or two and you felt yourself teetering close to the abyss of snow madness, a sure antidote was to visit one of the local greenhouses. My favorite was a rather small one attached to a garden center and gift shop where, the snowy January I was in the seventh grade, I went to buy plants and supplies for my science-fair project. To open that door from the gift shop into the greenhouse was to walk right into a tropical rain forest, a humid, fragrant jungle so impenetrable that a pith helmet and machete seemed appropriate. Lush, shiny leaves and feathery fronds spilled over every wooden table, poked out from under the benches, crept over the mossy white pebbles of the walkways, pushed up and out at the glass. There were bushes whose branches were laden with miniature oranges, tables of African violets with white, pink, and purple blossoms, benches of strangely shaped, succulent cacti protected by fearsome spikes that made you tingle just looking at them, trays of tiny seedlings and coleus cuttings, palms growing up from giant pods, the sensuous waxy flowers of hibiscus and vining jasmine, ferns hanging from the ceiling, tumbling in luxuriant profusion, coffee plants and ginger plants and snake plants and philodendron with smooth leaves and variegated leaves and jagged indented leaves, geraniums, a Christmas cactus cascading with orchidlike flowers, an enormous rubber tree that must have been decades old, plants with curious fleshy leaves and fuzzy leaves and knobby spiked leaves that had to be touched, a trellis here and there tangled in vines of exotic unknowns. And the heavy moist air held the wonderful fragrance of damp sphagnum moss and potting soil and sand, the citrus of the lemon trees, April's aroma of hyacinth, the green chlorophyll smell of leaves, of growing, of living, of life. Scurrying in and out of this jungle was a wiry old man who, at his workbench in the corner of the greenhouse covered with a jumble of projects, seemed to me as remarkable as a medieval alchemist. I remember Ted always in a red plaid shirt, a ubiquitous pack of Camels in his shirt pocket. He had, always, a day-old white stubble, dirt packed under his fingernails, and his hands, constantly moving, looked as though they would always be the color of potting soil, even if scrubbed and scrubbed. Ted was absorbed in his work and would let customers wander around his greenhouse for as long as they wanted without bothering them; but when he learned I was working on a science project about the propagation of plants, those preoccupied eyes behind the thick glasses with heavy black frames became the eyes of a fellow seventh-grader opening up a much-hoped-for chemistry set on Christmas morning. I had been working that winter on our jalousied side porch, planting seeds saved from the Halloween pumpkin and breakfast grapefruit and oranges, poking toothpicks into an avocado and suspending it in a glass of water, collecting spores from the underside of fern fronds and germinating them in a terrarium, cutting off the tops of carrots and turnips and a slice of a potato and watching them grow into new plants. Ted took me on a crash graduate-level course in botany. He showed me how to unpot a snake plant and divide it into five plants; how to take a leaf from a rex begonia, cut some slits into the veins of the leaf, fasten it down on the soil with unbent paper clips, and wait for roots and leaves to form. He explained what vermiculite and perlite were and in what proportions they should be mixed with potting soil or soil from the garden; the differences between clay pots and plastic pots; how rooting hormones were best applied in making cuttings; the uses of fertilizers and plant foods. He knew the Latin names of all the plants in his greenhouse and used them conversationally until they became as familiar as my own. He taught me how to take a gratula plant and cut off a ring of bark on one branch, rub the cut with Rootone, wrap the cut in sphagnum moss and surround the moss with plastic held on by rubber bands. A new plant would grow at the incision. I watched, as I would have watched Dr. DeBakey perform open-heart surgery, as Ted grafted a section of an oxilo tree cactus (the scion) onto an obruntal cactus (the stock). That winter our side porch became a plant laboratory, the wooden shelf along the windows covered pot to pot with experiments. I dug through the snow and hacked out a bedraggled pachysandra, brought it into the garage for a day to thaw, cut the roots into pieces, and planted them to see if they would grow. Episcia runners were held down in another pot to root. Geranium cuttings were placed side by side in water, potting soil and vermiculite to see which grew the best. Endless variations of sun and shade were tested, varying amounts of rooting hormone were applied, measurements of roots and shoots were taken with the precision of an ophthalmologist, experiments were conducted in hydroponics and in growing plants under artificial light. The creation of this home greenhouse, and the frequent visits to Ted's that the science project necessitated, no doubt staved off any serious seizures of snow madness that long, cold winter. No longer can you get into your car on a winter's day and be in an Ecuadorian rain forest in ten minutes. Ted's greenhouse and the whole garden center of which it was a part are long gone; a concrete and glass office building and huge parking lot occupy that sunny spot. The veteran's greenhouse on Mountain Avenue where we'd buy fresh-cut carnations was demolished years ago for more suburban homes. And Mary McDonald's greenhouses across from the school are gone now, too. Now flowers and plants are shipped in overnight from places where they're less expensive to grow, and it's almost easier to fly to Ecuador than to find a greenhouse nearby. Today doctors diagnose the melancholy-inducing days of January as seasonal affective disorder and note its symptoms as depression, a craving for carbohydrates, excessive sleeping and social withdrawal, and treat it with light therapy, exposing the patient to strong light to try to trick the brain into thinking it's not really winter. Maybe that works, though walking into the dry cleaner's on a January day of freezing drizzle and sleet, smelling spring and seeing the narcissus in bloom on the counter, can sometimes provide all the fix you need. Like a swimmer on the starting blocks, the world awaits spring, muscles tensed, quivering with anticipation to leap through the air at the crack of the starting gun. With winter not even half over, a crocus on the sunny south bank below the brick walks thinks it hears the signal one day in a February warm spell and opens its yellow flower to the sun. The myrtle nearby sees it and tries out some blue blossoms. Determined daffodils poke up through the heavy wet soil as if the time indeed were now. The goldfish in the brick pool outside the living room windows come to the surface looking for you, expecting once again that their food will be served on a silver platter at high noon, and even a frog has come out of its long sleep from the muck at the bottom of the pool to sit for a while on top of the heater, keeping its bottom warm while it contemplates whether it really is time to wake up. Gardeners are not immune to such irrational exuberance, to jumping the starting gun, to thinking, against the weight of all experience and evidence and common sense, that maybe this year will be different, that maybe the winter's back has been broken, that the crocus and daffodils, the goldfish and frog and the ever optimistic forsythia, must know what they're doing: spring will be early this year. And so we start making plans. Spring cleanup first; pick up all the twigs and sticks and branches that have come down in the storms and blustery winter winds. All those acorns on the lawn that the squirrels never got around to, they'll have to be raked up with the bamboo rake. Those weary old oak leaves that eluded the last raking of fall and have been skittering around the terrace all winter and blown into corners and lodged under bushes, get all of those out, too. The big viburnum that hangs over the brick path in back needs to be pruned down a good three or four feet before the leaves break; it's too high already, and with every rain it hangs over the pathway and gets in the way. Now is the time to do it so I don't crush the fern and hosta around it later. (The wispy remnants of a bird nest dangle from the crotch of one of its overhanging branches, just a few inches over my head. As I passed back and forth last spring, did the mother and her babies freeze in terror, hiding up there like the Frank family in the attic annex?) The teak benches and chairs on the terrace should be cleaned with a once-over-lightly Clorox-soaked sponge to remove the moss and dirt without stripping the weathered gray patina. Will have to get the hose out to rinse them off well. From the front beds, last year's annuals have to be yanked out -- the first snow came too quickly while they were still blooming, and their bleached skeletons have stayed there since -- and the soil in those beds has to be cultivated and maybe some fresh soil from the nursery dug in to bring in some new nutrients; it's worth it, they'll do better this season. Is the nursery open yet? February 4? Better call first. (Maybe better not call. They'll know right away who it is even if I don't tell them, even if I try to disguise my voice: the one they have to scold every spring for insisting on buying a carload of flats of annuals weeks before they sanction their planting. "I'll keep them in a cold frame for a few weeks," I have to promise before they'll let me take them home, as they look at me suspiciously while running my American Express card through the machine. Like they don't believe I really have a cold frame. Which I don't. I start planting the minute I get them home. Some spring soon, I'm afraid they're going to ask for proof, and like a teenager with a fake ID, I'm going to have to procure on the streets a fake cold-frame certification.) While I'm out front, I should really clean out the goldfish pool. This will necessitate putting the goldfish in a clean garbage pail filled with water from the pool and dredging all the debris and gunk so the water will be clearer this year, but that's one heck of a messy all-day job, and maybe that could wait until next weekend. Some of the stones in the wall down by the road were hit by the snowplows and have to be straightened out; that's where the daffodils will be blooming first, so it should look neat and should be done right away. The lavender must be cut back before the new growth starts, and some of the bricks in the paths were shattered by ice, and those should be dug out and replaced with extras from the pile of old bricks behind the oak at the back of the yard, and that hemlock the ice storm bent over, that's got to be cut back or, better yet, braced up. I could drive a metal rod into the ground behind it, out of the way, and tie a green cord from the tree to the rod to hold it up. And there are some of those winter weeds in the beds that should be dug out while they're weak and haven't started sending their roots miles into the soil. Every weed rooted out now will save a lot of work all season. There's a lot to do. So I get out the trusty old garden cart and haul it up to the back of the yard. High overhead, a hawk soars like a U2 spy plane, back and forth with just the tilt of its wings, observing everything, nothing escaping its notice. A gentle wind blows in the pines as if to blow away winter, and in the sun it's getting warm enough to take off my sweatshirt and hang it over a dogwood branch. I start picking up winter's debris while contemplating some of the benefits of global warming, feeling quite virtuous to be getting a jump on the season for once. With these chores out of the way, I'll be able to devote the necessary time to planting, rather than rushing it as always happens. As I work, I keep looking over my shoulder as if I've gotten away with something: this was the best that old man winter could dish out? What a wimp! But the Arctic Express roars through that night, and the next day what was forecast as rain turns into a determined February sleet and then wet, heavy snow that makes tepees of the pine and spruce across the road, and the yellow flower of the crocus shivers in shock and the green of the daffodil shoots turn the dead color of frostbitten fingers with the onset of gangrene, and the goldfish have dived deep out of sight, and the frog is at the bottom of the pool with a blanket of muck pulled over its head as it falls back asleep to resume its wait for the real coming of spring. The garden cart in the garage, work gloves and pruners resting on it where I left them, waits, too. Gardeners by nature, perhaps, but definitely by necessity, are patient. They plant bulbs on a raw November weekend, knowing that it will be months, the longest months of the year, before they see the results on warm spring days. They have faith that the packets of seeds started inside early in March will become beds of cutting flowers by July. They can visualize how the four-foot-high pines they manhandle home from the nursery and plant along the back border will fill in and grow up, and not next year or the next but years later will form exactly the desired backdrop. They tinker with the garden plan year after year to bring it closer to their concept of perfection, and when something doesn't work out, they make new plans for next year. They plant a sapling that will not in their lifetime mature into the shade tree they know will be just right for that spot, yet they plant it eagerly, expectantly, hopefully, confident that someone else will appreciate its placement. Thomas Jefferson, always the farmer, always the gardener, was well into his final years "still planting trees, to yield their shade and ornament a half a century hence...too old to plant trees for my own gratification, I shall do it for my posterity." Waiting, you learn that everything in time comes to you, that if you are patient enough and wait long enough, you will see it all. There is never any need to plan a safari or adventure of discovery; it's all right here. "I have travelled a good deal in Concord," Thoreau told us. In time, everything in Concord will reveal itself to you, just as Emily Dickinson, who lived her life in the same house in Amherst and "never saw a moor" and "never saw the sea," discovered the entire world was there at her doorstep. 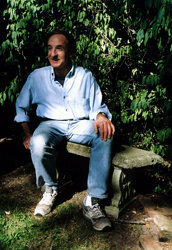 Having spent her life as a travel writer "wandering the world," Jan Morris found, as she said, that "the truest truths are small ones, to be discovered wherever you are. If I could have my time over again, I think I would choose to roam only my own small patch of country -- my bro, as we say in Wales. Instead of exploring continents and empires, I would investigate ever more intensely our modest fields, hills and villages; rather than wild beasts of Africa, I would watch the herons on the river, the frogs in the pond." For those who wait and watch, it's all happening right outside the window. Each day is a pageant, a play, produced just for those who are watching, from the drum roll as the watercolor wash of dawn behind the ridge raises the curtain on another day, to the sun's journey westward, the shifting light and shadow, the shaping and reshaping of clouds and their travels across the sky, the endless subtle changes of the day, the infinite variety of days, the coming of night with glimpses of the far reaches of the universe in starlight that, since the days of the crusades, has been traveling through space for us to see at that moment. Each stage setting -- be it a rainy day of gloom and fog or a spring day of promise -- is a spectacle. The orchestration is a symphony of the wind in the trees and under the eaves, the song of birds, the drone of insects, the squeak of fresh snow, the rustle of fallen leaves. The greatest actors and actresses people this theater of the day, the mailman making his rounds, commuters rushing to work, the landscaper blowing leaves into the road, teenagers walking home from school, everyone playing out the dramas and comedies of their lives that make Shakespeare's and Shaw's seem contrived and simplistic. The show goes on and on yet never repeats itself. Each act you happen to see is a grace, a gift to be opened now, that will not wait until you're ready. We walk through these most wonderful of stage settings every day, maybe stopping to glimpse a part of the action once or twice, more likely not seeing any of it. "The morning wind forever blows," Thoreau wrote in Walden, "the poem of creation is uninterrupted; but few are the ears that hear it." Daily we pass blithely through the halls of museums and galleries more spectacular than the Louvre and the Metropolitan. When for a moment we suddenly see and listen and feel, life is enchantment. Longing to be free of the demands of the presidency, Thomas Jefferson wrote of his "interest or affection in every bud that opens, in every breath that blows." A leaf examined becomes a work of art as if mounted, matted, and framed. How yellow the dandelion, how remarkable its transformation to the powder-puff seed head, how incredible the dispersal of its seed in the wind. What mysteries a rock by the side of the road contains, what stories of explosions of worlds and ice-bound ages it could tell if we knew how to listen. "My profession," Thoreau wrote in his journal on September 7, 1851, "is to be always on the alert to find God in nature, to know his lurking-places, to attend all the oratorios, the operas in nature." Wasn't that other world traveler, Emily Dickinson, on the same search in her poems? "Attentiveness without an object," Simone Weil once said in words that could have been describing Emily's curious poems, "is the supreme form of prayer." Why are we here? John Updike was asked over a century later. "We are here to give praise" was his answer. "I describe things," he added, "not because their muteness mocks our subjectivity but because they seem to be masks for God." Today the sun is blinding on the snow, so bright it seems focused with a mirror, and the snow is melting on the roof, dripping off the gutters, splashing through the drainpipes. It sounds like a faucet has been opened wide, with gallons and gallons of water racing through the leaders, and still there is a cover of snow on the sunny roof, melting. I put my hands around the leader by the front steps and feel the cold water flowing, the ice age breaking up. There are puddles on the steps where drops of water are falling from the roof with the erratic rhythm of a leaky faucet. From underneath the old pile of frozen snow at the top of the driveway where the plow pushed it weeks ago, a rivulet of glacial melt, steady and sure, flows down the driveway to the road, along the side by the rock wall below the barberry hedge, down into the storm drain. The sun is squeezing the ridge like a sponge, and all the excess moisture trapped in the soggy soil by the winter freeze is draining out, running downhill to join the streamlet splashing toward the drain, to join the hollow rush of water somewhere beneath the road, flowing down, always down, washing winter away, down to the river Styx. "It is about five o'clock in an evening that the first hour of spring strikes," Elizabeth Bowen wrote in The Death of the Heart; "autumn arrives in the early morning, but spring at the close of a winter day." A strange observation that holds true again this year. As we shovel and salt the driveway each morning before work and trudge onward with our heads down, watching for black ice, bracing for the next storm, winter has gone away. Maybe the paperboy is ahead of schedule this afternoon, maybe there is something about the way the sun is setting behind the oaks and the way it's on the pine tree in the backyard, maybe it's the smell of air almost too warm for gloves that is of winter breaking up. Whatever, by five o'clock spring is here, and an hour or two later the peepers down in the swamps around Surprise Lake merely confirm what we already feel: the waiting is over. Spring has risen. Spring has risen indeed. May it be so. Planning, patience, persistence: the three human ingredients necessary to create a garden. Winter is a long time, and exactly what you planted last year and where you planted it become as fuzzy as a squirrel's memory of everywhere it hid stashes of acorns. Jotting notes in a gardening notebook of what is where and what blooms when and other observations will, over the years, facilitate the planning and development of what can become a special garden. Patience may be a virtue, but virtues may wear thin as winter drags on and the gardener wants to get to work. There's always something that can be done, even in a snowbound winter, from trimming and pruning when you can see the skeletal form of bushes and trees, to wandering around the winter garden and visualizing, from this perspective, what changes might improve it, to reading about other gardens in books and magazines and trying to understand what tricks make them look so good. Any serious gardener could give courses in persistence. At one time or another, everything will go wrong, and sometimes everything will go wrong at once. Yet the gardener will be back out there every time, looking for all the world like Churchill after Dunkirk, the determined gaze, chin thrust forward, wielding a trowel and clippers, growling in words and tone not subject to misunderstanding: "We shall never surrender." "This sensual, literate story of a small New Jersey garden in four seasons over two decades is as vivid as spring tulips, as comic as the frogs in midsummer, and as bright as the stars of Orion on a winter's night." "With contagious enthusiasm, Vanderbilt captures the beauty of impatiens and marigolds, the wonder of snowy skies and sprinklers in the sunshine, the satisfaction of a bed well tended, and all the other things that get us out of bed at the crack of dawn to hit the ground digging." "Here it is -- the armchair gardening book of the season. This is as delightful a book about gardening as I've read."